Coop Pank clearly has the best cash network in Estonia! You can withdraw cash free of charge from all ATMs and Coop stores with Coop Pank bank card. As easy as buying milk! The cashback service makes withdrawing cash as easy as buying goods, only instead of the goods the checkout employee gives you cash. You must make a purchase for at least 1 euro at a Coop store in order to withdraw cash. The minimum amount of cashback is 5 euros and the maximum amount is 100 euros per purchase. Cash withdrawal is free of charge with the Rahn and Rändrahn plans. A service fee of 1 euro is otherwise applied.  Cashback is available at all 350 Coop stores in Estonia. These stores are marked with the Coop Sula label. When do I have to say that I want cashback? You have to say that you would like to get cashback before you confirm the transaction with your PIN. To guarantee the best service, you are only offered the option to get cashback if there is enough money in the till. Does the person at the till see how much money I have in my account? The person at the till does not see how much money you have in your account. You can check your account balance in Internet or mobile bank. Do I have to consider the limits on my card when I get cashback from a store? There are two limits on a debit card: cash limit and payment limit. Cashback is issued at the expense of the cash limit and purchases are covered by the payment limit. Thus, it’s possible that you have enough money on the card, but the transaction is rejected by the bank because you have exceeded the relevant limit. You can change the card limits on the Internet bank and mobile bank, or at a branch of the bank. Can cashback be taken with a contactless payment? You must always confirm cashback transactions at Coop stores with your PIN. Will I get bonus points for using cashback as well? Cashback is separate from purchases and no bonus points are given for it.